This article originally appeared in SLAM 171. SLAM PH has the numbers to prove that Jayson Castro, Gary David, Gabe Norwood, June Mar Fajardo, Marcus Douthit and Coach Chot Reyes are armed and ready for the FIBA-Asia Championship. When the Gilas Pilipinas project was started almost 5 years ago, the goal was for the Philippines to assemble a team that would have some semblance of continuity that would steer the country to its first Olympic berth in years. Now, with a versatile group that Head Coach Chot Reyes can mix and match depending on the situation, the Gilas team seems poised to make a splash in the upcoming FIBA Asia tournament this August. With so many notable names hailing from the PBA – names that include LA Tenorio, Jeff Chan, Marc Pingris, Jimmy Alapag, Ranidel De Ocampo, Japeth Aguilar, Beau Belga, Larry Fonacier – the team is ripe with talent. 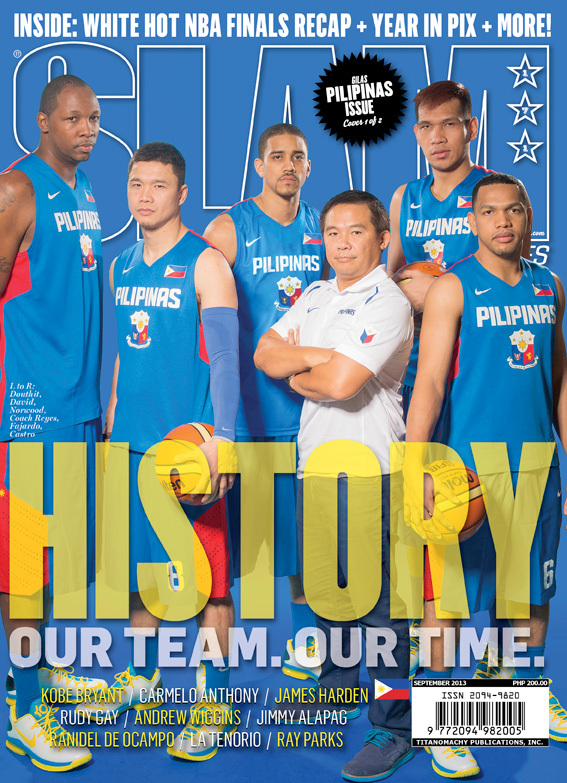 Our cover boys for this issue are Jayson Castro, Gary David, Gabe Norwood, June Mar Fajardo and Marcus Douthit. Each guy represents a different – but equally important – piece of the puzzle. Castro is a demon in the open court. An inch or two short of 6 feet, he makes up for the lack of height by always being one of the fastest guys on the court. With his quickness and body control, Castro always finds a way to finish his endless assaults at the rim with a made basket. When defenses sag off him, he can use his quick trigger to score from practically anywhere on the court, particularly from downtown or pass to an open teammate. Over his PBA career, Castro has made 213 out of his 630 three point attempts, good for an effective field goal percentage of 50.7%. Worth noting is that Castro’s assist rate (percentage of field goals he assisted on when he plays) was 24.8% and 25.1% in the All Filipino and Commissioner’s Cup, respectively. This means that he assists on almost a quarter of his teammates’ shot attempts. What does this mean? Castro is an efficient points producer because he can score with the ball efficiently and passes the ball well enough while not committing a lot of turnovers (12.9% turnover rate in the last two conferences). While Castro provides the scoring and passing, David provides only one but he provides it in ways that Castro doesn’t – in bulk. In a Gilas team that’s loaded with talented players, David stands out among the rest because he’s their most efficient volume scorer. His volume shooting from behind the arc will have to be respected – he’s averaged at least 4 3PT attempts over the last five seasons and has made 33% of his attempts over that span (effective field goal percentage of 50%). That’s how you define volume and efficiency. Add that to David’s ability to take and make free throws (over the last five years, he’s averaged 6 free throw attempts per game while making 82% of them) and his ability to use his shooting to get to the rim and what you get is an extremely efficient volume scorer. Sandwiched between those two scorers is a utility man who goes by the name of Norwood. Unlike the other two, Norwood prefers to do a lot of other things outside of scoring. Between his scoring (career average of 10.5 points per game), his ability to rebound (career average of 6.5 rebounds per game), his ability to pass (career average of 3.4 assists per game) and his ability to cover multiple positions defensively with his athleticism – from point guards to shooting guards to small forwards – Norwood is a coaches’ dream. Unlike the other three, Fajardo doesn’t have as much time playing with the big boys – he was only recently drafted in 2012. But he’s the banner bearer for the future of Philippine Basketball, both locally and internationally, and it all starts with his physical profile. June Mar stands at a legit 6’11” and weighs 270 lbs – big enough to play center in any league. But while men with that much height and weight are usually stiff and uncoordinated, Fajardo isn’t. In just his first season in the pro league, spanning two conferences, he’s proven himself worthy of the hype surrounding him. Offensive Rating is a measure of how many points a player produces (not scored) for his team on a per 100-possession basis while usage rate is a measure of how many possessions he uses while he’s on the court. Combining those two gives us a good idea of how good a player is offensively. June Mar produced 107.1 points per 100-possession (on a usage rate of 16.8%) in the All Filipino Cup. That’s good for 14th among players who played at least 7 games and averaged 20 minutes. Surprisingly, June Mar found a way to improve on that when he finished the Commissioner’s Cup 6th, producing almost 112.2 points per 100-possession (usage rate of 21%). Considering he played with a much stiffer competition (against imports) makes it all the more impressive. It’s no surprise therefore that Fajardo’s Player Efficiency Rating for each conference were 21.1 and 20.6 – numbers indicative of a star (or in June Mar’s case, a budding star). There is without a doubt that June Mar will play a huge role for the Gilas team – as a help defender, as a post scorer and defender – providing relief for Douthit and quite possibly, becoming the starting center for the national team in their next iteration. Speaking of which, Douthit is the core of the Philippines’ attempt at rewriting history. He provides the post scoring that no one can provide on the roster right now. He’s averaged 15.7 points, 11.1 rebounds, 1.5 assists, 1.1 steals and 1.5 blocks while shooting close to 62% from the field. Those are numbers of a star – and Douthit is a star among stars. His ability to hit midrange jumpers gives him room to operate and his ability to post up allows other players to play off him – whether it’s through cuts or through spot-ups. This current iteration of the team is very much a team that’s built to compete against taller, better and more athletic players. With skilled centers (Douthit, Fajardo, Slaughter), quick and mobile bigs (Aguilar, Thoss, De Ocampo), wings who can shoot, pass and defend (Norwood, Fonacier, Reyes, David) and floor generals (Alapag and Tenorio) not to mention volume shot creators (David, Chan and Castro) – this team is one that’s ready to compete. 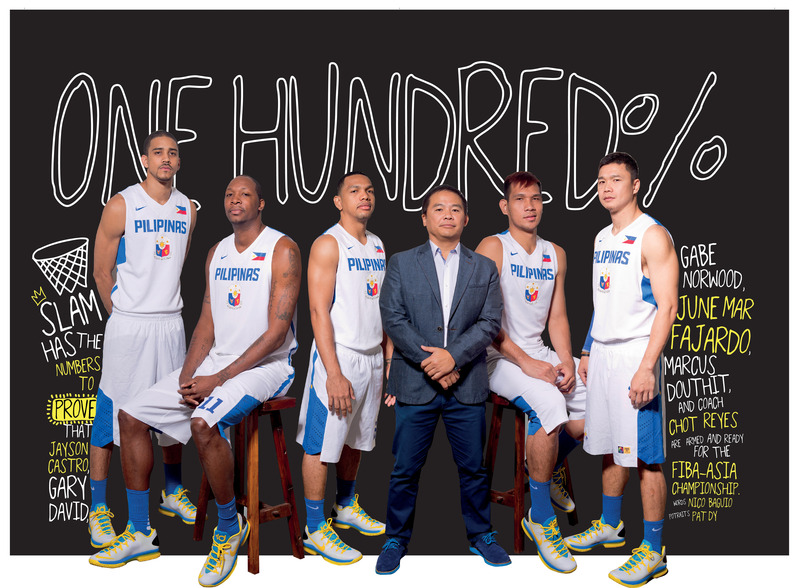 With the guidance of Reyes – 5-time PBA Coach of the Year – this team is brimming with potential waiting to be realized. Coach Chot has done a marvelous job preparing these boys – exposing them to different situations and training constantly. With the tournament just a few months away (a tournament that’s hosted here in Manila), Filipinos are hopeful that this team that can win it all.